Boise State Will Allow Detroit High School To Have Blue Turf As Long As They Don't Call It "Blue Turf"
Boise State is very particular about their turf, which is blue, and the name of their turf ("blue turf"), because no one in college football has turf quite like them (in that their turf is blue). Most turfs, you see, are green. Watson said Boise State was never against Oxford putting in the turf or continuing to raise the funds to complete the full cost of the project, but Boise State just wanted to make sure Oxford by itself avoided the term "Blue Turf" in promoting the field and events on it. "They just said: ‘We recognize that you're doing a blue field and we just want you to know that here's what you can do and what you can say and what you can't,' " Watson said. "We respect their trademark and their properties and all the things Boise State stands for. But it was flattering in a way that they were paying so much attention. Like any other college, they're paying attention to their properties. They just wanted us to know what the limits are." 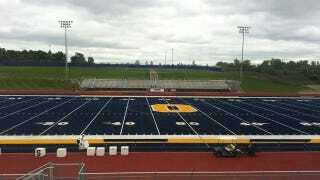 The limits are simple: Oxford just has to clarify what kind of blue their blue turf really is. Click On Detroit points out that the high school's blue "is a deeper, more navy blue color than the Boise State blue." They might simply call the turf "Dark Blue Turf," "Navy Blue Turf," or "Blue That Is Not Boise State Blue Turf." If they really want to get philosophical about it, I'd suggest "'What Is Blue Anyway, Man' Blue Turf."